A marriage is a partnership between two individuals who love each other and who support each other with strength and grace. Caitlin and Christian truly embodied these characteristics when they were married at St. Peter’s of Great Valley in Malvern and the Phoenixville Foundry. Even in the face of terrible weather, they both embraced it together with an air of adventure! The day started off fantastically as we arrived for wedding day preparations. Caitlin and Christian got ready just off of a golf course, providing a sweet view for some outdoor shots later. 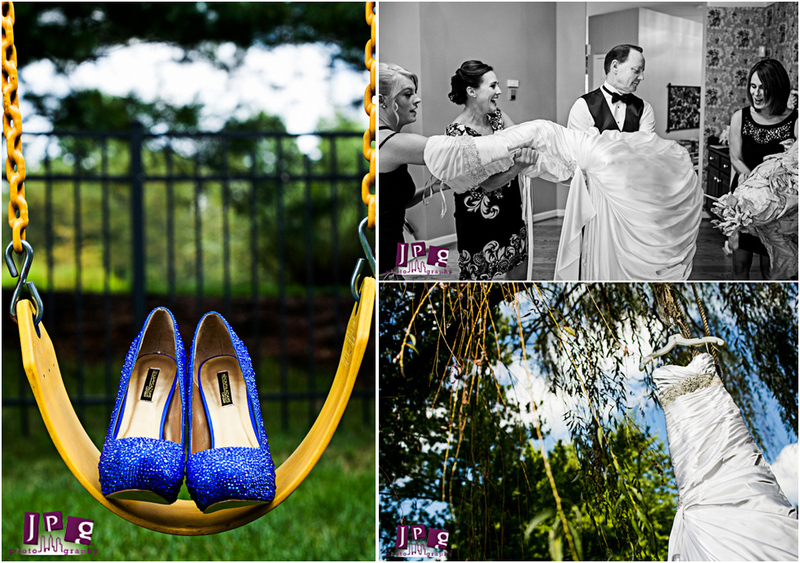 We took some pictures of her dress hanging from a rope swing, giving it a homey feel. 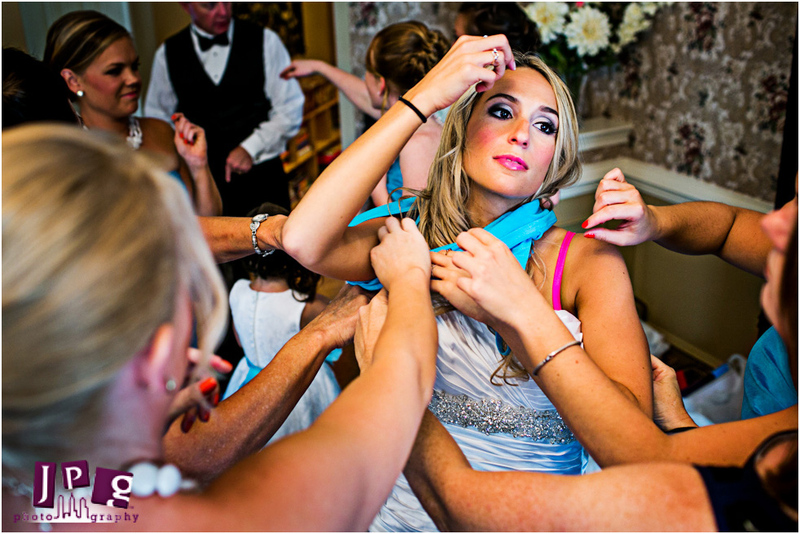 And we relaxed with her friends for awhile as they helped her get ready. One of the best things for our clients to do, especially on a day where weather can be tricky, is to trust in JPG. So, about ten minutes before there was a downpour, Caitlin and Christian made their way outdoors for a quick shoot. 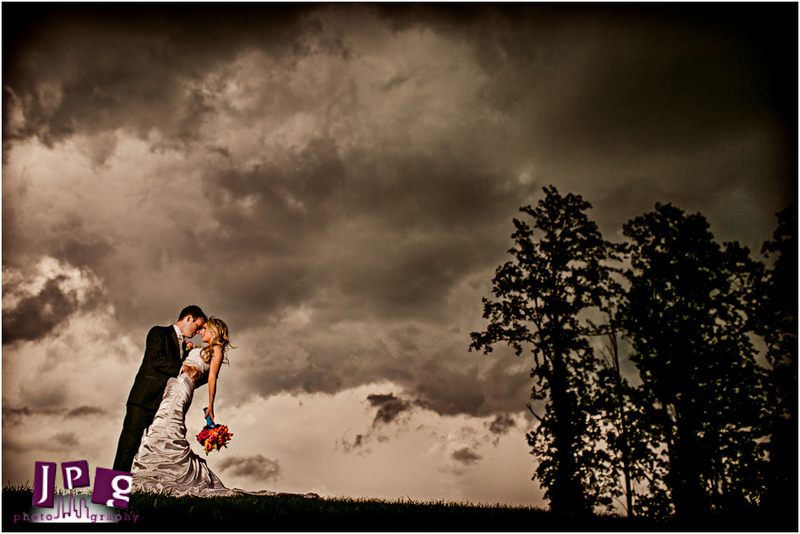 We took some amazing photos with them in front of the dark clouds – it was very dramatic! A Valley Forge park ranger assisted in stopping traffic for us, as we took some more awesome shots of the couple in the rain. At the ceremony, we enjoyed finding out the different ways that Caitlin and Christian expressed their love for each other. There was the perfect mixture of adoration and sassiness in the looks they gave each other at the altar – they were so much fun to shoot! The party moved to the Phoenixville Foundry for the reception, which proved to be a pretty sweet venue. There was still some foundry machinery there, giving it a rustic feel, but with a modern twist of new lighting fixtures. It was bi-level, so there were plenty of high and low angles that were great for shooting. The reception itself was a lot of fun. We were huge fans of their clothespin s’mores as desserts, and the band was very talented. 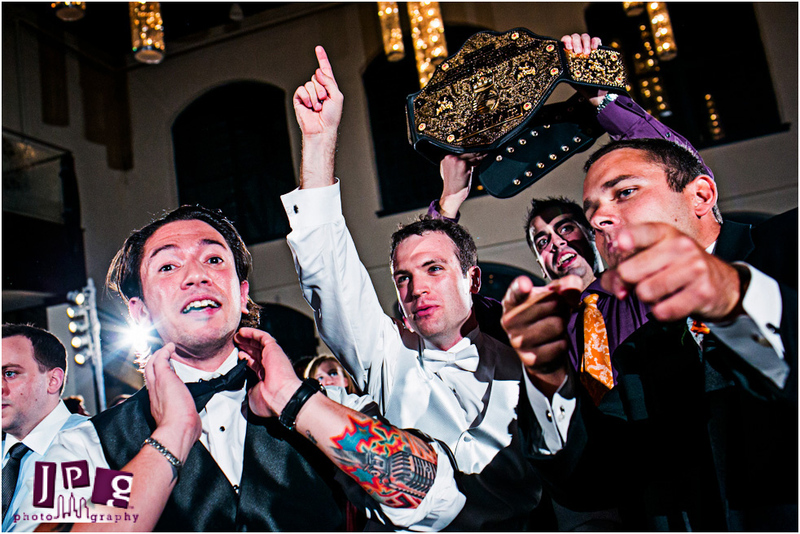 Christian put on his WWE champion belt as he lit up the dance floor, and everyone had a good laugh as his father slid down backwards on the rail. 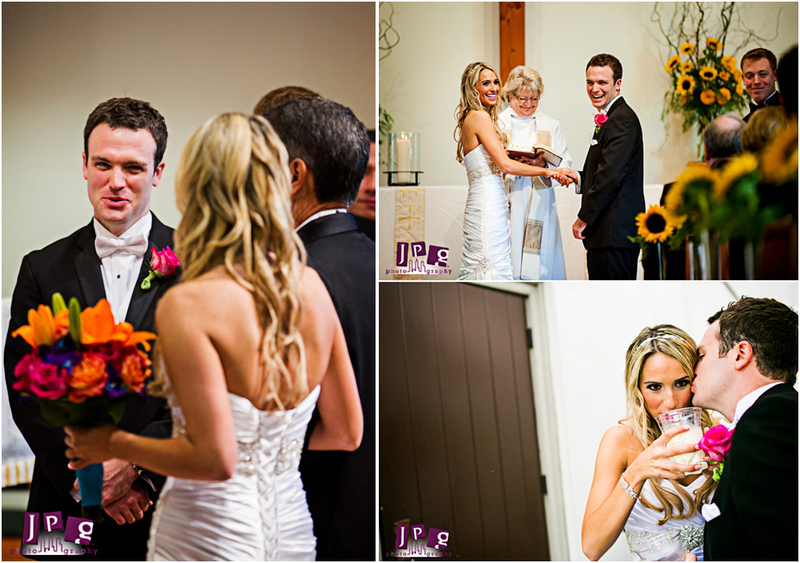 Caitlin and Christian, thank you both for letting JPG in on your special day. And always remember to embrace the rainy days with the same love as the sunny ones!